WASHINGTON (CNS) — Cardinal William W. Baum, the archbishop of Washington from 1973 to 1980, died July 23 at the age of 88 after a long illness. He was a cardinal for 39 years — the longest such tenure in U.S. church history. Cardinal Baum witnessed history from the Second Vatican Council through the election of the first Latin American pope, and he made history himself. By the spring of 2011, he had worn the red cardinal’s hat for nearly 35 years and surpassed the record of Baltimore Cardinal James Gibbons, who had been a cardinal from 1886 until his death in 1921. The soft-spoken Cardinal Baum, whom some of the Vatican’s Swiss Guards called “the gentle cardinal,” found no merit in his longevity. “It’s a gift from God,” he said. Services for Cardinal Baum will include a vigil from 3 p.m.-6:30 p.m., July 30, at St. Matthew’s Cathedral in Washington, a vigil Mass the same day at 7 p.m. and a funeral Mass at the cathedral at 2 p.m. July 31. Interment will be in the crypt of the cathedral. Then-Archbishop Baum in 1976 was named a cardinal, becoming at 49 one of the world’s youngest cardinals. Beginning in 1980, he served at the Vatican, first as prefect of the Congregation for Catholic Education and then as major penitentiary, or head of the Apostolic Penitentiary, one of the Vatican’s three tribunals, until his retirement in 2001. In 1979, as the archbishop of Washington he hosted St. John Paul II on his first pastoral visit to the U.S., joining him for a Mass for 175,000 people at the National Mall and for a visit to the White House with President Jimmy Carter. One year earlier, the cardinal had participated in the conclaves that elected Pope John Paul I and later Pope John Paul II. While the public was surprised when the new Polish pope appeared on the balcony of St. Peter’s Basilica, Cardinal Baum said the world’s cardinals were not surprised by his election — they knew him well as a man of great faith, intellect and courage. In 2005 following the death of St. John Paul II, Cardinal Baum acted as the senior cardinal priest in the conclave that elected Cardinal Joseph Ratzinger, who took the name Benedict XVI. Only Cardinal Baum and Cardinal Ratzinger participated in the conclaves of 1978 and 2005, choosing three popes. A pioneer in ecumenism, then-Msgr. Baum served during Vatican II as a theological expert, working with the Vatican’s Secretariat for Christian Unity. He participated in drafting the council’s landmark Decree on Ecumenism that was approved in 1964. 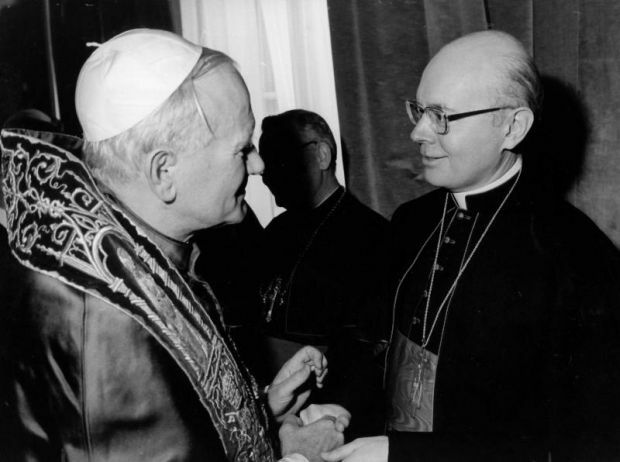 That same year, the U.S. bishops formed their Committee on Ecumenical and Interreligious Affairs, choosing Msgr. Baum as the committee’s first executive director. After serving in that role for five years and as chancellor in his home diocese, Msgr. Baum was appointed by Pope Paul VI to be the bishop of Springfield-Cape Girardeau, Missouri, in 1970. Three years later, the pope named him archbishop of Washington. From 1972 to 1975, he served as chairman of the U.S. bishops’ Committee for Ecumenical and Interreligious Affairs. As bishop in Missouri and Washington, he made ecumenical and interfaith dialogue a priority, including for instance, supporting the work of the InterFaith Conference of Metropolitan Washington. On a larger stage, Cardinal Baum led the Vatican Congregation for Catholic Education from 1980 to 1990 as it undertook studies of every U.S. seminary and oversaw the drafting of new guidelines for Catholic colleges and universities. In that capacity he oversaw, at the request of St. John Paul, the apostolic visitation of all of the seminaries and houses of formation in the United States. While at the education congregation, he also served on the commission that developed the Catechism of the Catholic Church. William Wakefield Baum was born Nov. 21, 1926 in Dallas, but his family moved to Kansas City, Missouri, when he was young. He wanted to be a priest from a young age, inspired by the faith of his family and by the example of his parish priest and the Sisters of Mercy from Alma, Michigan, who taught him. On May 12, 1951, he was ordained a priest of his home Diocese of Kansas City-St. Joseph. The cardinal’s work in reaching out to people of other faiths made a lasting impression on his priests, including Father Tom Kalita, the pastor of St. Peter Parish in Olney, Maryland, who was ordained by then-Archbishop Baum in 1974. He praised the cardinal as a man whose dialogue with people of other Christian denominations was rooted in respect. “You build bridges by having a respect for individual persons. … He always sees people as children of God, as brothers and sisters in Jesus,” Father Kalita said. He died in Washington at a residence run by the Little Sisters of the Poor.